Belize is located on the Caribbean coast of northern Central America bordered on the north by the Mexican state of Quintana Roo, on the west with the Guatemalan department of Petén, and on the south with the Guatemalan department of Izabal. To the east in the Caribbean Sea, the second-longest barrier reef in the world flanks much of predominantly marshy coastline. Small cay islands are scattered along the reef. There is an abundance of lagoons along the coasts and in the north. Its capital is Belmopan and almost 40% of the country is “protected as parks and natural reserves”. 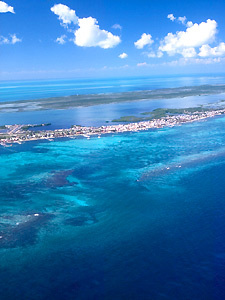 Belize is the only country in Central America not to have a coastline on the North Pacific Ocean. The Belize Barrier Reef platform lies on the Atlantic-Caribbean coast of Belize and extends from the border with Mexico in the north, to near the Guatemalan border to the south. The Belize barrier reef belongs to the Central American biogeographical province. The Belize Barrier Reef System has recently been declared a UNSECO World Heritage Site. The coast of Belize lies in the outer tropics, characterized by higher extreme and mean temperatures that occur in lower tropical latitudes. Mean annual precipitation fluctuates between 1,500 millimetres (mm) to the north and 4,000 mm to the south. A dry season characterized by strong easterly winds, runs from January-February to May-June. Strong winter storms blow from October to February. Until May, winds tend to be strong and fairly constant (16-24 kph). In the summer there are occasional strong squalls with winds up to 48 kph. The hurricane season occurs between August-October. There are over 500 species of fish, plus a great diversity of scleraetinian corals, hydroids and molluscs, sponges, marine worms, and crustaceans. The area harbors one of the largest population (300-700 individuals) of West Indian manatees in the world. Several bird species of conservation concern are found in the cayes and atolls. Three species of sea turtle (loggerhead , green, and hawksbill) nest in Belize and are routinely encountered between the coast and the barrier reef. Major seabird and waterbird colonies include those of red-footed booby on Half Moon Caye, brown booby on Man O’War Caye, and common noddy on Glover’s Reef, and breeding brown pelicans and the magnificent frigate bird. The Belize Barrier reef System is very sensitive to sudden changes in conditions required for it to thrive in i.e., warm, clear and clean waters, normal salinity, the absence of sedimentation and physical destruction. The reef ecosystem depends upon warmth and light from the sun, and needs a constant supply of fresh, clear seawater from the surrounding oceans. Reefs also need the help of nearby mangrove forests and seagrass beds, which aid in filtering and trapping sediment found in runoffs and riverine waters. Many reef animals also depend on mangroves and seagrass beds for food and as nurseries for their young. The Coral reefs are vulnerable when exposed or subjected to sedimentation (from inshore and coastal construction, upstream mining or farming, and dredging); land-based run-off (from fertilizers and sewage released into reef waters); and unsustainable finishing practices leading to coral degradation. In Belize, Coral reefs and mangrove-lined coasts provide critical protection against erosion and wave-induced damages from tropical storms. However, vulnerabilities brought about by climate change include: (i) ocean warming, (ii) rising sea levels, and (iii) ocean acidification. From the 18th to the 20th century, Belizean Mahogany was highly sought after by European cabinet-makers and ship builders. During the 19th century, plantation owners tried to produce sugarcane, cacao and coconuts but did not meet with the success and profits of their neighboring Caribbean cousins. Today, Belize operates a small, private-enterprise economy mainly dependent on Tourism, Agriculture (Fisheries) and Agro-product manufacturing sectors including exports of natural resources (marine products, citrus, cane sugar, bananas, and garments). Oil discoveries in 2006 bolstered economic growth. Exploration efforts continue and a small increase in production is expected in 2009. Major concerns continue to be the sizable trade deficit and unsustainable foreign debt (equivalent to nearly 70% of GDP). Recent expansion in the tourism cruise ship subsector builds on a foundation of nature-based adventure travel, diving and hiking. Two of Belize’s major industries. tourism and fisheries, rely heavily upon coastal mangroves and coral reefs, and the majority of its population and valuable real estate lies along coastal areas that are sheltered by this natural habitat. They support artisanal fishing communities, and drive vibrant tourism industries, drawing snorkelers, divers and sport fishermen from all over the world. Belize has been successful in the region for creating local jobs through the tourism industry supported by the Barrier reef system. Such jobs account for roughly 15% of the workforce while the wider “tourism economy” sectors that directly or indirectly support tourism employs nearly 30% percent of the workforce. 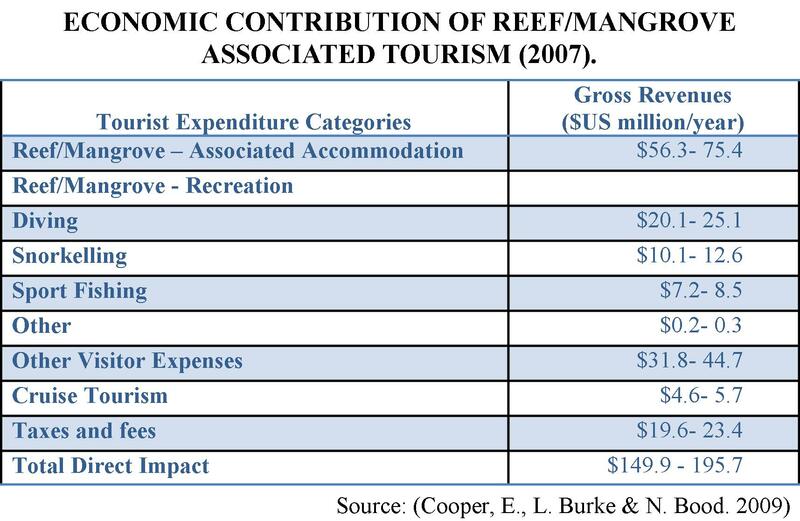 Total Tourist Spending associated with coral reefs and mangroves in Belize is estimated at approximately $150 – $196 million per year (see table below). Total revenues from the fisheries industry (production and processing) fall between $14.2 and $15.9 million per year. Of this total, $11.2 million comes from exports, and the remainder from in country sales through Co-operatives, local markets, restaurants, and informal sales (see table below). 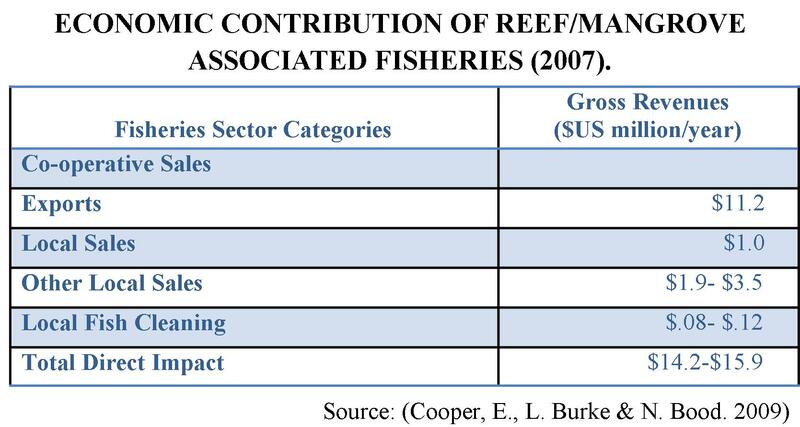 The shoreline protection services from coral reefs in Belize are valued at between US$120 – 180 million per year in potentially avoided damages through reduced erosion and storm damage whilst Mangroves within 1 km of the shoreline are estimated to contribute between US$111 – 167 million per year in potentially avoided damages (see table below). – Total Population Estimates of Belize: 321,660. – Total Working Population Estimates of Belize: 210,626 (14+ years of age). – Employed population estimates: 114,465, Labour Force Participation Rate: 59.2%. – Unemployed population estimates: 10,172, Unemployment rate: 8.2%. The Belize Barrier Reef Complex can be divided in three major provinces (Northern, Central and Southern), each having distinctive reef community composition and geomorphic characteristics. 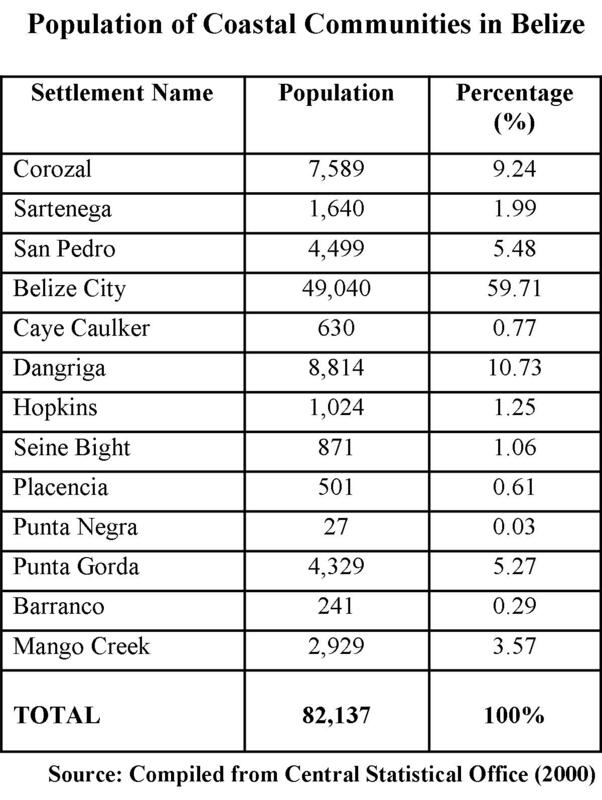 Approximately 82,137 people, or 33% of the population of Belize, reside in eight villages, four towns and one city along the coast as noted in the table below. Conservation efforts are directly/ indirectly affected by increasing poverty among coastal communities, literacy rates, historical or traditional resource use patterns, the increased cost of living, the rising cost of fuel and the annual threat of natural disasters. Belize attained national independence on the 21 September 1981 following its change of name from “British Honduras” to “Belize” in June 1973. Belize operates under a parliamentary democracy based on the Westminster model and is a member of the Commonwealth of Nations. The primary executive organ of government is the cabinet, led by a prime minister. The judicial system includes local magistrates, the Supreme Court, and the Court of Appeal. (i) Coastal Zone Management Authority and Institute: provides institutional arrangements for coastal zone management in Belize. The CZMA facilitates and earmarks funding for technical and management support in planning, implementing and environmental monitoring activities in the Belize Marine Protected Area System. (ii) Department of Environment: The Environmental Protection Act (1992) provides the framework through which the Department of Environment enforces regulations preventing pollution. (iii) Fisheries Department: The Fisheries Department regulates the exploitation of finfish, conch and lobster within Belize waters under the amendment to the Fisheries Act (1983). (iv) Belize Tourist Board: The Belize Tourist Board regulates the tourism industry, including the expanding cruise ship industry, which many view as a growing threat to ecologically sensitive areas. The Belizean government has passed several laws to protect the barrier reef and combat signs of overexploitation. In 2000, the Fisheries Department declared a network of strategic marine reserves for Belize divided into the three provinces: Northern, Central and Southern Belize. There are currently thirteen Marine Protected Areas in Belize, including seven World Heritage Sites. This also includes eight designated marine reserves, administered by the Fisheries Department and local NGOs. Additionally, there are two Natural Monuments, one National Park, and one Wildlife Sanctuary. 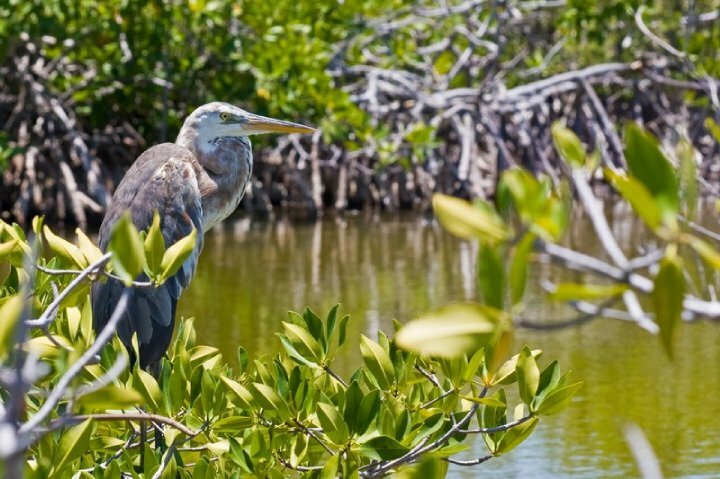 There are seven Crown Reserves, which are essentially bird sanctuaries on small cayes, and seven coastal protected areas. The Belize Barrier Reef World Heritage Site (BBRWHS) consists of seven MPAs and was proclaimed in October 1996 under the World Heritage Convention. This cluster of MPAs includes an area of 96,300 ha and represents the range of habitat and the character of the Belize Barrier Reef. The seven MPAs include two national parks, two natural monuments and three marine reserves. Archeological evidence shows that the Mayans inhabited Belize as far back as 1200 BC, building the commercial centre of Cahal Pec situated in the western part of Belize and the kingdom of Caracol among the Pine Ridge Mountains. Armed Spanish explorers arrived in Belize in the 1500’s and the Mayans, then facing severe drought and economic turmoil, were easily slaughtered and decimated by foreign diseases. 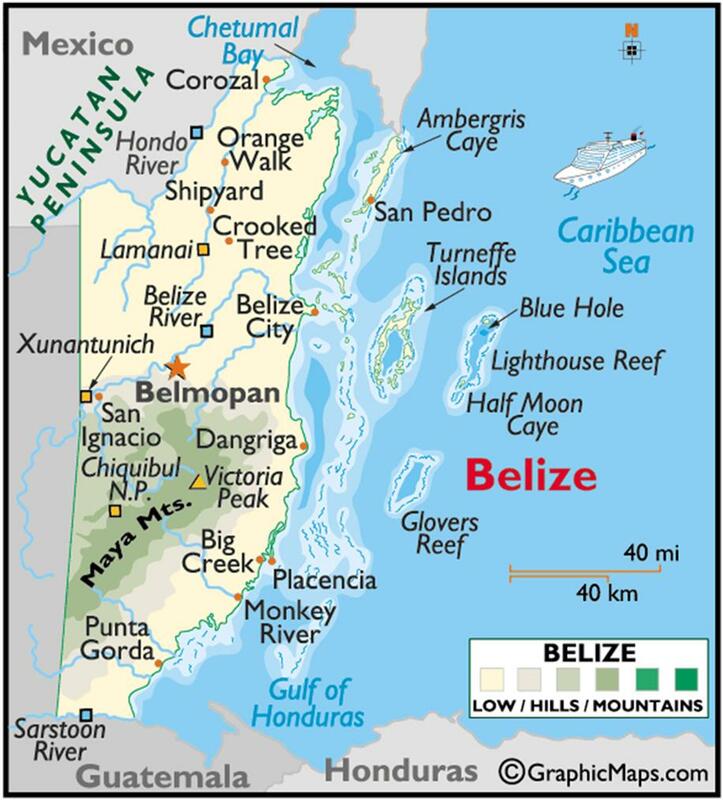 By the early 17th Century, Belize had become an outpost for English pirates known as Baymen and they used the Belizean coast as a strategic point for attacking the Spanish. Spain tried to reclaim Belize via diplomatic channels but these advances were rebuffed by the British leading to a surprise attack by the Spanish where Belize City was burned down. In the 19th century, what is now Belize was officially declared as British Honduras, a crown colony with an appointed governor. At that time, the country housed British, Mayan, Spanish and African influences. Several slave revolts led to the abolition of slavery in the colony in 1838. Belizeans consider themselves to be both Central American and Caribbean, as their culture encompasses cultural aspects of both regions. English is the official language of Belize but Spanish and Creole are just as widely spoken. Ethnicity forms the core of Belizean culture with the most important ethnic groups being the Mestizo, Creole, Garifuna and Maya. The predominant ethnic groups in Belize are the Mestizo and Creole, which represent some 48.7% and 24.9% of the population of Belize, respectively. The Creoles and Garifunas have their origins in Africa by the way of the Caribbean. The Garifunas, being a cultural and racial fusion of Africans, initially came from Honduras. These two ethnic groups of Belize together comprise about three quarters of the population in the country. Belizeans are also bound by common social codes i.e., the primacy of courtesy. April 2010 © C-Change Secretariat (Caribbean).